Tucked behind Kingsland Road and encased in a rickety black fence lies Kingsland Basin, home to Hackney’s secret narrowboat community. From the bridge overlooking the basin from the Regent’s Canal, a series of neatly moored narrowboats bob like toy ships. The brightly coloured vessels are surrounded by pots of budding vegetable plants, compost bins and paint pots: a tidy yet shambolic home to the basin’s residents. I am greeted by Hannah Engelkamp, a freelance journalist and relative newcomer to the canal lifestyle, who has lived in the basin for two years. The problem with the boat dwelling, she says, is that there is a chronic shortage of moorings. As most are short stay, the majority of narrowboat dwellers ‘tow path’ – travelling from mooring to mooring. Kingsland Basin is different. It is a permanent community, with electricity, water, recycling and even a floating garden, donated last year by the Shoreditch Trust. According to British Waterways, Kingsland Basin is the only independently owned and run residential mooring in the UK. 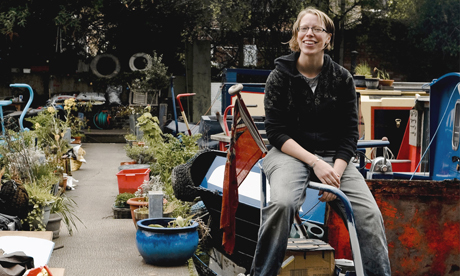 The Canals in Hackney Users Group – appropriately abbreviated to CHUG – are the collective leaseholders of Kingsland Basin and as a local charity, they work to preserve and promote the canal for the benefit of surrounding communities. I am shown out by the other Basin residents, who regale me with stories about the biggest taboo – falling in the water. “Sometimes when we’ve had barbeques on the Basin you see someone teetering on the edge of the water with a drink – then splash!”, says Hannah Engelkamp. But the water is only a couple of feet deep. I turn back to thank Jack for showing me onto his boat. He has entered into an impassioned conversation with a neighbour. “I always come with good intentions of working on the boat, but do nothing,” he chuckles. “But there’s an old saying among boat dwellers: ‘narrowboating is the fastest way of slowing down’”.